The Adjutant General, Maj. Gen. Douglas A. Farnham, passes the Army flag and along with it, the responsibilities of the Assistant Adjutant General-Army to newly promoted Brig. 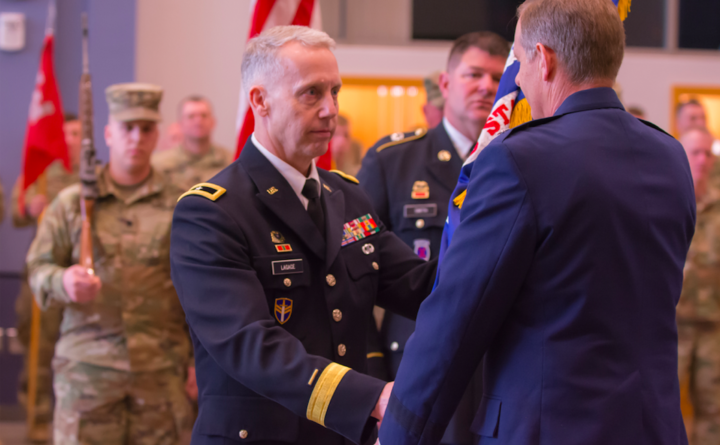 Gen. Donald O. Lagace, Jr. Lagace conducted his transfer of authority in front of senior staff, representatives from across the Maine National Guard, and his family March 2, 2019 at Camp Chamberlain Augusta, Maine. The Maine Army National Guard held ceremonies last Friday and Saturday to promote and install a new second-in-command. Lagace is a Gulf War veteran who enlisted in the Army in 1982 and commissioned as an officer through the ROTC program at the University of Southern Maine in 1984. He comes to the assistant adjutant general-Army post from the position of U.S. property and fiscal officer for Maine, in which he was in charge of federal funding and property held by the national guard here. As assistant adjutant general-Army, Lagace will be in charge of training, manning and equipping the guardsmen in Maine. Corbett retired after 33 years in the service, starting with the U.S. Marine Corps in 1986 and including a deployment to Afghanistan in 2006.